Facial toners, known also as tonics, lotions, astringents are solutions that remove surface skin cells, soap residue and oil from the skin. They are often heavy on water and alcohol and sometimes contain other ingredients like salicylic acid, witch hazel, benzoyl peroxide. A good toner will remove surface oils and debris which may be helpful for oily or acne-prone skin. A big misconception is that a toner will close enlarged pores, but actually it gives the appearance of minimizing pores as the toner irritate the skin and make it swell slightly. The toners remove excess oil from the skin, whisk away impurities that usually lead to blemishes and breakouts. Most of the dermatologists say that if you cleanse your face regularly twice a day with the appropriate skincare products you can go without a toner, but those with oily or acne-prone skin swear by toners as they keep their skin clean and fresh and remove the excess oil from the surface of the skin. Most of the people with problem skin look for a toner containing alcohol as it dry the pimples faster and there is nothing wrong in that. You should look for a product specifically designed for oily or acne-prone skin, containing salicylic acid, glycolic acid, hydroxyl acid. If the amount of alcohol is too much it can provoke production of more oils which in turn means more pimples, more blackheads, clogged pores. Splash your face with warm water and make sure your hands are clean. 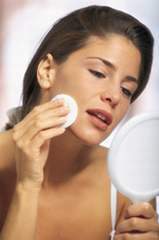 Apply the cleanser to your face with circular motions. Make sure you cover all the areas – forehead, chin, nose, cheeks and neck then rinse with lukewarm water. A toner should always be applied to a cleansed face. It should be applied with a cotton pad. Saturate the cotton pad and pat the toner gently over your face and neck area. Apply it to the forehead, cheeks, chin and nose, or to the whole face. Never rub your skin when applying toner. After applying facial toner your skin may feel a little tight and dry and that’s why you need to apply a facial moisturizer after toning your skin. Witch Hazel, Tea Tree Oil, Aloe Vera, Glycerin, Sodium hydroxide, fragrance, Methylparaben, Benzoyl Peroxide, Salicylic Acid, Polyaminopropyl Biguanide, Panthenol, Lactic Acid, Centella asiatica, rose geranium essential oil, chamomilla recutita. Some harsh ingredients in the toner may cause irritation characterized by redness, itching, burning, and peeling. Always apply the toner to a cleansed face.